Thanks to Doug Haller, grandson of Sgt Kenneth Caswell (Radio). 1/Lt Myron A. Christensen (A/C). T/Sgt William B. Greenwood (Radarman) may have left the crew and been replaced by S/Sgt Philip S. Mather (Radio). Sgt Kenneth Casswell (Radio) also flew with this crew and may have taken the place of Mather. Standing - Left to Right: T/Sgt Theodore Ocander (Engineer), 1/Lt Arthur A. Gebert (Navigator), S/Sgt Philip S Mather (Radarman), ___ (Gunner), T/Sgt Paul Q. O'Leary (CFC), Lt Orin P. Johnston (Bombardier). Kneeling - Left to Right: ___ (Gunner), Sgt Donald St. 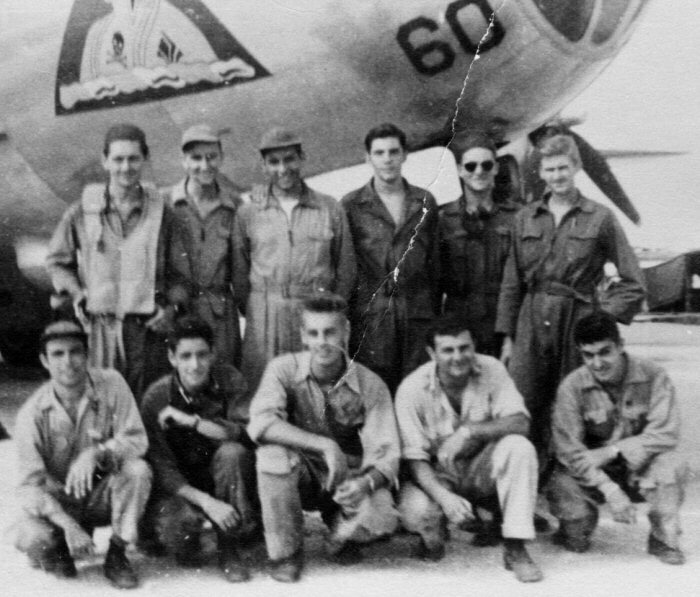 Priest (Tail Gunner), 1/Lt Myron A. Christensen (A/C), 1/Lt Albert P. Semonian (Pilot), Sgt Kenneth Caswell (Radio). This crew generally flew "Tojo's Nightmare".